Speaker stand is composed of two aluminum pipes and two aluminum boards, which is perfectly suitable for placing Echo 2nd generation Speaker. The round-shape and non-slip silicone pad design prevent your echo from Accidentally knocking down or children, pet being tipped over, provide protection in all domains. Keep your room neat and tidy, even a nice decoration in your smart home. Turn the screw tightly with screwdriver, easy to assemble and disassemble, compact size for saving space. 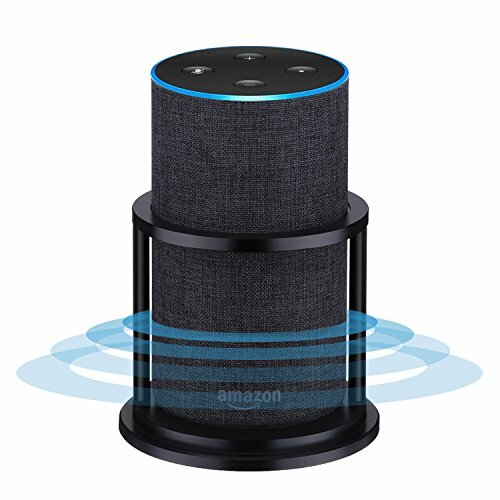 Main Item Size: 10 x 12 x 12cm / 3.9" x 4.7" x 4.7"
CUSTOM DESIGNED FOR ECHO 2ND GENNERATION: The Azomor stand is one of the best alexa accessories which is specifically designed to perfectly fit the all-new Alexa Echo 2nd Generation. This echo stand holder helps improve stability with superior durability and protection. Keep original sound quality and voice recognition. The round design allows for easy placement of the speaker stand at any places of your smart home. PREMIUM QUALITY: Sandblasting and anodizing process of 100% premium aluminum, durable & sturdy than acrylic without fading or cracking, a forever companion for your Echo Alexa. The Azomor echo stand will makes your home echo even more stand out and classy sleek. TASTEFUL DESIGN: Unique groove design on the bracket board, perfectly fit for the bottom of echo, giving your echo an extra stability and a integrated look in this stand. Our stand also equipped with premium silicon ring at the bottom, features to avoid the stand slipping down or scratching the furniture. We only design two slim yet strong pipes for this speaker stand without blocking the original sound and the voice recognition from the echo, style yet sturdy. SIMPLE & STYLISH: Looking like a unified entity with the Echo, simple and elegant. A great decoration for any places of your smart home such as living room, bedroom, kitchen and study etc. Whether you¡¯ve got dogs, cats, children or clumsy friends, our sturdy base helps protect your Echo from bumps or tipping. This great speaker stand with reliable packaging is also a perfect gift for any occasion to whom have the all-new echo 2nd generation. WHAT'S IN THE BOX: 1 x Bracket board, 1 x Ring board, 2 x Pipes,1 x Screwdriver, 2 x Screws, 1 x Quick Install Guide. View More In Speaker Stands. If you have any questions about this product by Azomor, contact us by completing and submitting the form below. If you are looking for a specif part number, please include it with your message.